VANCOUVER, BRITISH COLUMBIA — Sea urchin, sea snails, jellyfish, mackerel. Those are not the decadent seafood choices you expect to dominate the menu of one of Vancouver‘s most esteemed restaurants. Frank Pabst, though, has an endearing term for these smaller, lesser-known creatures. He calls them the “Unsung Heroes” of the sea. That’s because when chefs and diners substitute salmon and halibut for under-utilized menu items they assist in sustainability efforts. In February, the executive chef of Blue Water Cafe + Raw Bar serves up 11 items that demonstrate the extraordinary range of flavours to be found in the British Columbia waters. The small sharing plates, which range from $9.50 to $12.50 each, introduce many foodies to seafood they wouldn’t imagine trying in Canada. The Blue Water “Unsung Heroes” menu also proves creativity can foster environmentally friendly eating habits. It’s neither gimmick nor trendy marketing ploy. Pabst and Blue Water come about this project with the right intentions. The “Unsung Heroes” menu is inspired by the Vancouver Aquarium‘s heralded Ocean Wise program, which encourages responsible seafood consumption. Restaurants across North America incorporate Ocean Wise when planning their menus, with Vancouver establishments leading the way. A decade ago, Blue Water, located in the trendy Yaletown area, was one of the first to adopt the sustainability practices. 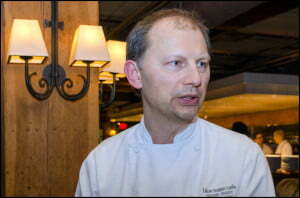 Pabst has keenly stuck by the principles with the hope that diners decide they can also try some of these unique seafood items in home recipes. First, you need to give them a try at Blue Water. You eat out at Pabst’s restaurant because you trust his skills as a chef, so why not try his take on whelk? The sea snail is served chilled with a tangy aioli sauce. 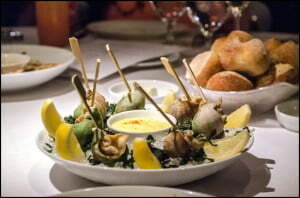 You eat it with a toothpick, giving the sensation of a savoury fondue. 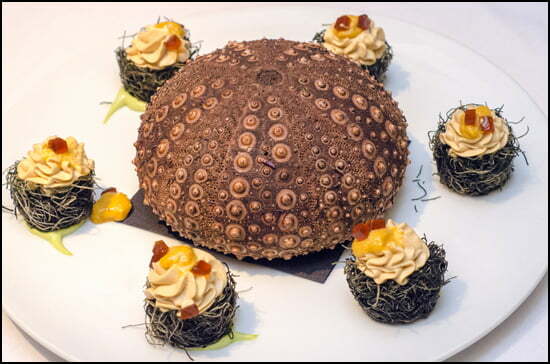 The one must-try dish, however, is the Sea Urchin mousse ($12.50). It was a unanimous choice as the favourite among the table of diners I was with. The rich, luscious mousse is served atop a crispy shell with ponzu jelly and avocado sauce. It’s the rare creation that pleases both adventurous eaters — who are always in search of something new — and less-risky diners, whose requirement is simply that what they eat tastes good, no matter how pretty or technically crafted. Blue Water has been a favourite restaurant of mine for years — beginning before I was a interviewing chefs and writing about travel and destination restaurants. It delivers what visitors come to the west coast to enjoy: Exceptional seafood, including sushi that will call you back for more, served in a warm, inviting room that still manages to ooze with elegance. It is fine dining with professionalism and without formality. Many restaurants wouldn’t undertake an initiative like Pabst’s “Unsung Heroes.” You could say the true unsung hero is Pabst for putting sea cucumber and anchovy as the featured items on a plate. But that might come across as patronizing. The heroes, actually, are people like you, for giving the menu a try and understanding the higher-minded goals that are at work on your plate. Menu price range: Dinner entrees range from $24.50-$43.50. You must order: One of the seafood towers. They range from $28, $78 and $128.